Who Gets Hurt Most by Higher Unemployment? CBO estimates that economic growth in 2013 would be roughly 1½ percentage points faster than the agency now projects [i.e., 1.4 percent] if not for the fiscal tightening. By Okun's rule, this suggests unemployment will stick at about 8 percent this year -- about where it is -- instead of a number a lot closer to 7 percent (Okun's rule turns that 1.5 percent faster GDP growth into about 0.75 of a percentage point (ppt) lower unemployment). In fact, the CBO predicts that unemployment rate this year will move from all of 7.9 percent in the first half of the year to 8 percent in the second half. Thanks, dudes. Actually, we should thank them for the warning -- and even R's are sounding Keynesian (okay, military Keynesianism, but still...) right now. The point I wanted to make here is that everybody's unemployment rate ain't created equal. 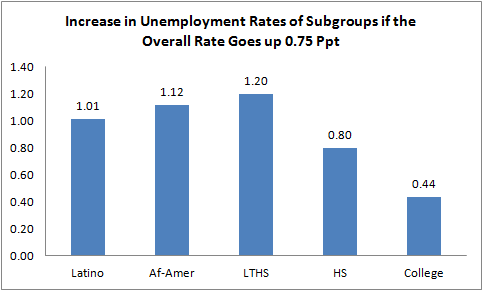 If you look at the correlation between the overall jobless rate and that of various subgroups, you'll find that an increase in three-quarters of a point translates into a much larger increase for minorities or those with lower levels of education, and a lesser increase for say, college educated workers. The figure below provides a rough idea. For Latino or African-American job seekers, a 0.75 ppt increase translates into a 1-1.1 ppt increase; for high-school dropouts, it could mean a 1.2 ppt increase. For college-educated workers, on the other hand, their rate would be expected to go up about half as much. You could carry the calculation another important step forward and estimate the real wage losses associated with these unemployment rate increases. I'm working with some colleagues on this and will have some info soon, but back-of-the-envelope, for a low-wage worker facing the kinds of increases in the higher bars in the figure, we're probably talking about a 1% real loss in their hourly pay. So, we're talking real losses for real folks who really can't afford it. And for what? I've yet to hear anything approaching a compelling explanation as to why our political class should be whacking away at our already weak economy. Like I said, I'm past the point of asking these folks to help improve things, but I guess I'm still crazy enough to ask them to not make them worse.